Today is our last post for Zoo Week! We had a blast making sticky tiger crafts last week and today we decided to share how we worked on some number skills with this giraffe spots number game! This giraffe spots number game involved snacking and playing with numbers... two things my kids love! It also didn't require too many supplies, so it was easy to put together. 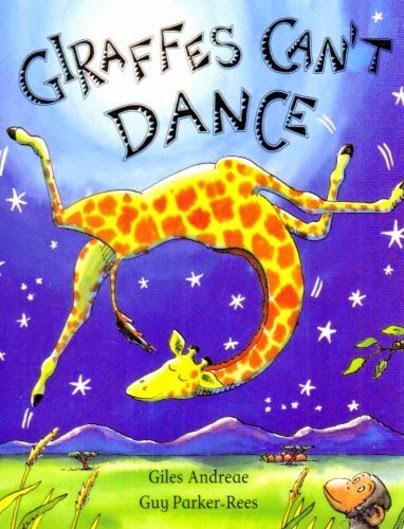 To start off we read Giraffe's Can't Dance by Giles Andreae and then we did some giraffe spots number matching! Giles Andreae is our Virtual Book Club for Kids author for July so we have enjoyed getting to know some of his books better. Make sure you scroll down to see all of the Giles Andreae book inspired crafts that are shared in our link up. This game is super simple to play. There are a few things you need to prep-ahead and then you can get started! First thing you need to do is print out a copy of the giraffe printable for each child. Next you need to write individual numbers all over the giraffe's body or simple number sentences if the child is older. After that, grab your dice and you are ready to play!! To play... each child will have a giraffe printable with numbers on it. Each child takes a turn rolling the dice. Kids then get to take a piece of cereal from the bowl and use it to cover up the number that is rolled! Kids play again and again (taking turns) until the first player fills up their board completely! For my 3-year-old we just used numbers 1-6 but for my 6-year-old I created basic number sentences that each added up to 1,2,3,4,5, or 6. I also threw a few subtraction problems in there. The games got super competitive, but ended up being a lot of fun! My toddler loved participating by sticking cereal pieces all over the giraffe to create spots. It was darling!! Do you have any other favorite zoo themed crafts or activities or books you could share with us? Head on over to our Zoo Week landing page to see the other activities as we share them this week. Check back later this week to see our other giraffe themed activity as well! Check out more Giles Andreae book inspired crafts and activities below as part of our Virtual Book Club for Kids July Blog Hop! Feel free to link one up if you have a craft or activities post that goes along with a book by Giles Andreae. Oh wow, what a fantastic idea and I even bought Cherrios today! 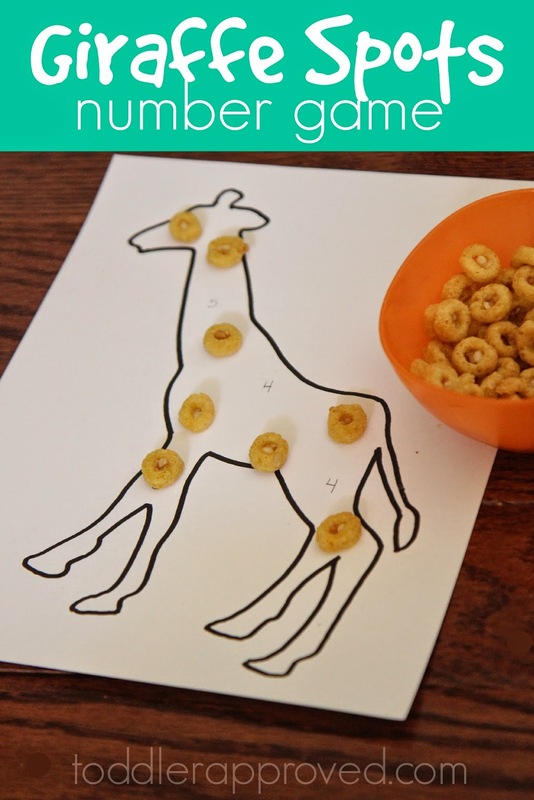 I will definitely be trying this activity as my boys love their Giraffes Can't Dance book.